I wish for... more friends! 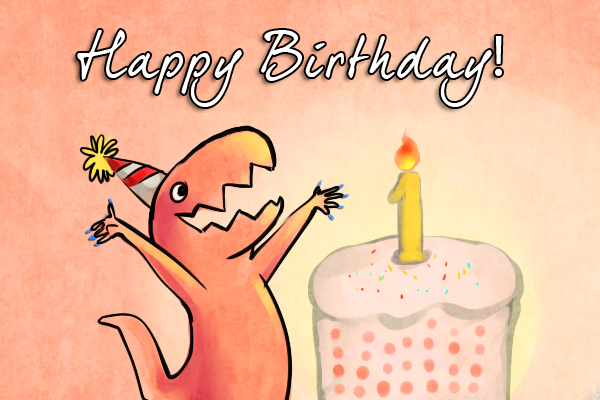 Happy birthday to my blog! Nailzilla turns 1 year old as of today. I'm pretty happy that I've been able to keep this running through a move to a different city, lack of a computer and a new job. It's gone through layout changes, got its own domain, finally has high quality camera for pictures. Along the way, I've learned that simple is better, so my latest layout is reflecting this. Today my stash sits at around 400 polishes and still growing. I'm all for doing a purge, but that time will come. I've gone through neon, glitter, jelly and nail art kicks, grew the longest nails I've ever had and hauled foreign polish. Today I'm proud to say that I don't want to stop blogging! I've never really ran a blog before, so having a place to write about polish and a place to show people my hobby has made me very happy. Your comments inspire me and make my day. Thanks to you, readers! I'm going to be doing a giveaway to celebrate this occasion, so look forward to more free goodies! and I'm glad I stumbled upon your blog, it's one of my favorites. I love your creativity for manis and writing style. Congratulations!!! Your blog is one of my all time top ten favs!!! Whoaaa reaaly? Thank you so much! I love the bday 'zilla!